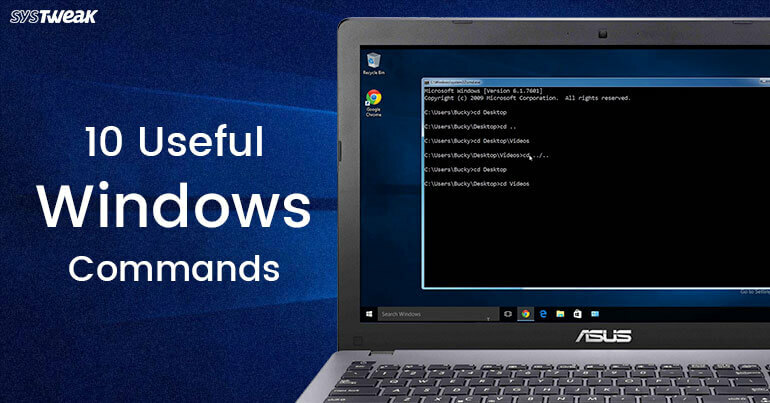 Windows is famous for its user-friendly design compared to the old MS Dos operating system, that required you to enter a long string of commands to do even the simplest of things. Which is why most Windows users tend to stay away from Command Prompt. But did you know that some important operations can only be performed via Command Prompt? As a user it is always better to have knowledge about the various commands of Command Prompt. Here, in this article we have summed up some commands that will surely benefit you. Starting with ipconfig, this command helps in finding the IP Address of your computer. Though you can get the IP address of your PC by diving into Control Panel settings. But that is for sure a tedious task. To use this command, launch the Command Prompt, type ipconfig and press enter. This will open a list of all network connections which your system is using. This command is useful when you have changed your DNS server and Windows holds the old DNS data as cache for a long time. Use this command to instantly clear all the cache of the previous DNS server. This command is useful when you are facing connection issues with a particular website or network. For example, if you are facing problem in opening blogs.systweak.com, then you can type the command ping blogs.systweak.com. This will send the data packet to our server and our server will acknowledge that we have received your data packet. This command will confirm that the amount of data sent is equal to the amount of data received. Also, it will show you the time taken to send and receive data. This command tracks the route followed by data packet from origin to destination. Say for an example if you type tracert blogs.systweak.com, it will show you all the hops during the journey of data packet from origin to destination. As the name specifies this command is used to shutdown the computer. There are in total 3 operations, which this command can perform just by changing the parameter. shutdown /s /t 0: Shutdown the computer. shutdown /r /o: Restarts the computer with advanced options. Using this command a user can check whether all the system files of system are digitally signed or not. On typing sigverif in command prompt a prompt will open which will ask for confirmation to check the integrity of system files. Click on Start to initiate the process. Once the process gets completed it will provide you the information about the system files which are digitally signed and which aren’t. As you all know that permanently deleted files can also be recovered by various recovery tools. However, this command will permanently delete the files from a drive by inserting random data on it. Once a drive is deleted using this command, then the data on it cannot be recovered by any means. This command initiates Windows system file checker tool to scan and look for the problem if any in windows system files. To use this command, run command prompt as Administrator and type sfc /scannow. This command also fixes the corrupted and missing system files. This command is used to manage various power options available within the system. Using powercfg /energy command you can get a detailed power consumption report on the system. Similarly, powercfg /hibernate on or powercfg /hibernate off will turn and off the hibernate node on your system. This command gives you the complete list of all the currently running task on your system. Task Manager can be considered as its GUI version which also shows the currently running task. Hope these commands will help you in better and effective use of your PC. If you still feel any confusion then submit your response in the text below.